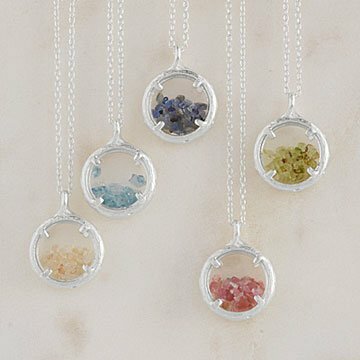 Each month of the year gets a gorgeous tribute thanks to these vibrant birthstone necklaces. An icy blue topaz for December, a rich ruby for July, a glowing green garnet for May—every color of the rainbow and every month of the year is well-represented in this necklace selection. The shining crystals and semi-precious stones are framed by circles of textured branches, adding to their made-from-nature appeal. The recycled sterling silver chain finishes off your new wear-forever piece—or make it a birthday gift (and instant heirloom). Handmade by Catherine Weitzman in Hawaii. No complaints. It was as i expected it to be. I purchased October for a friend that was turning 60. She loves both jewelry and Hawaii so I thought it would be perfect. She loved it! Very nice quality and really lovely.